Track time spent on tasks and bill your customers. Ability to assign multiple staff members on task and track timer per assigned staff. Add task followers even if the staff is not project member. The staff member will be able to track the task progress without accessing the project. Keep track of leads in one place and easily follow their progress. Records your company expenses and have the ability to bill to your customers and auto convert to invoice. Know more about your customers with powerful CRM. CRMs need to focus on customers and Perfex CRM does that with a powerful support system that helps you track and resolve issues quickly via the integrated ticket system and customer reminders. Assign reminders to yourself, one or many staff members and with one click, reminders can be sent to email and in-app notification system. These features and more can take customer satisfaction to the next level. Perfex CRM has many features designed to fit many applications. 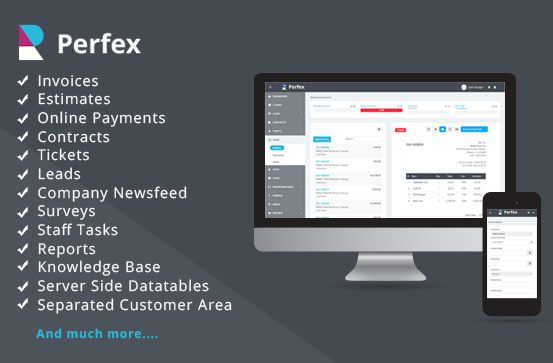 Read more about the features below and try the demo to see how Perfex CRM can help you succeed. Soyez le premier à laisser votre avis sur “Powerful Full CRM ready to use” Annuler la réponse.